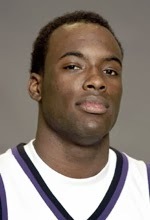 For the same reasons that Dwight Howard lost to Nate Robinson in the NBA slam dunk contest, Jasonn Hannibal never got his due as a dunker with the Pilots. People don’t respect tall dunkers, they make it look way too easy. Much in the same vein as Shaq, without much warning Jasonn could turn around and with one step be dunking in a dude's face. We need more guys who can finish with power around the rim like he could. Also, great dancer. He was with the Pilots for parts of 3 seasons but mostly played in the 2008-2009 season before transferring to Weber State to play with Damian Lillard. This guy had super raw skills but had athleticism for days. Most of the dunks I remember from him were alley-oops but he was 6’3" and I worried many a night that he would hit his head into the backboard. I miss you B.J., wherever you are! Hard to find pictures or video of Donald Wilson (2002-2006) but the guy could fly. He wasn’t the most consistent scorer for the Pilots but he didn't have to be while playing with Pooh Jeter, all he had to do was take it strong when Pooh found him open cutting to the hoop. He was an impact player and now he’s an impact salesman at ADT Security Services, get at him for all your security system needs. This man needs no introduction, the only player that made the list from the current team. He’s been posterizing guys on the bluff since 2011, I might have put him even higher if I could have found my favorite dunk of his on youtube which came his freshman year. All I can remember about it is I felt like he took off from the free thrown line. The best dunker in traffic on the list by far, he doesn't need much room to take off. I know what you’re going to say. Wally, you really gave the #1 spot on the dunk list to a white guy, that's blasphemous!?!? This was no reverse affirmative action decision, Sikma was (is) athletic, and gave hope to white guys everywhere for playing above the rim. It helps when you have the genes of a former 7 time NBA All-Star (Jack Sickma of the Seattle Supersonics). But Sikma gets extra points for having the total package: hops, power, and style.